Here are the ratings for The Vampire Diaries TV show. This supernatural series follows the life of 17-year-old Elena Gilbert (Nina Dobrev) who falls for a dark 161-year-old vampire named Stefan Salvatore (Paul Wesley). Their relationship becomes increasingly complicated as a result of Stefan’s malevolent and wickedly handsome elder brother, Damon (Ian Somerhalder). 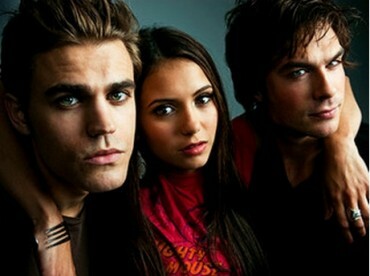 The third season of The Vampire Diaries typically airs on Thursday nights at 8pm on The CW network. These are the TV show’s ratings for the 2011-12 season, the best way to tell if The Vampire Diaries is going to be cancelled or renewed for season four. Check out our CW ratings report card to see how this show’s numbers compare with the others on the network. Final season three averages: 1.3 rating in the 18-49 demographic with 2.81 million total viewers. 1.2 in the demo (0% episode-to-episode change) with 2.53 million; fourth in the timeslot. Season average: 1.29 in the demo with 2.81 million. Demo average rank: #1 of 14 TV shows on the network (Fall 2011 – Spring 2012). 1.2 in the demo (+9% episode-to-episode change) with 2.54 million; tied for fourth in the timeslot. Season average: 1.30 in the demo with 2.82 million. Update: Vampire Diaries has been renewed for a fourth season. 1.1 in the demo (+10% episode-to-episode change) with 2.22 million; fifth in the timeslot. Season average: 1.30 in the demo with 2.83 million. 1.0 in the demo (-17% episode-to-episode change) with 2.21 million; fifth in the timeslot. Season average: 1.31 in the demo with 2.87 million. Demo average rank: #1 of 13 TV shows on the network (Fall 2011 – Spring 2012). 1.2 in the demo (-8% episode-to-episode change) with 2.44 million; fifth in the timeslot. Season average: 1.33 in the demo with 2.90 million. 1.3 in the demo (+8% episode-to-episode change) with 2.69 million; fifth in the timeslot. Season average: 1.34 in the demo with 2.93 million. 1.2 in the demo (-14% episode-to-episode change) with 2.64 million; fifth in the timeslot. Season average: 1.34 in the demo with 2.94 million. 1.4 in the demo (+8% episode-to-episode change) with 2.90 million; fifth in the timeslot. Season average: 1.35 in the demo with 2.97 million. Demo average rank: #1 of 12 TV shows on the network (Fall 2011 – Spring 2012). 1.3 in the demo (+8% episode-to-episode change) with 3.08 million; fifth in the timeslot. Season average: 1.34 in the demo with 2.97 million. 1.2 in the demo (+9% episode-to-episode change) with 2.74 million; fifth in the timeslot. Season average: 1.35 in the demo with 2.96 million. 1.1 in the demo (-8% episode-to-episode change) with 2.71 million; fifth in the timeslot. Season average: 1.36 in the demo with 2.98 million. 1.2 in the demo (-20% episode-to-episode change) with 2.86 million; fifth in the timeslot. Season average: 1.38 in the demo with 3.00 million. Demo average rank: #1 of 10 TV shows on the network (Fall 2011 – Spring 2012). 1.5 in the demo (+7% episode-to-episode change) with 3.32 million; third in the timeslot. Season average: 1.40 in the demo with 3.02 million. 1.4 in the demo (-13% week-to-week change) with 3.17 million; fourth in the timeslot. Season average: 1.39 in the demo with 2.99 million. 1.6 in the demo (+7% week-to-week change) with 3.51 million; fourth in the timeslot. Season average: 1.39 in the demo with 2.96 million. Demo average rank: #1 of 10 scripted TV shows on the network (Fall 2011 – Spring 2012). 1.5 in the demo (+7% week-to-week change) with 3.28 million; fourth in the timeslot. Season average: 1.36 in the demo with 3.28 million. 1.4 in the demo (0% week-to-week change) with 3.03 million; third in the timeslot (ahead of ABC and NBC). Season average: 1.3 in the demo with 2.82 million. 1.4 in the demo (+17% week-to-week change) with 2.89 million; fourth in the timeslot (ahead of ABC!). Season average: 1.3 in the demo with 2.78 million. 1.2 in the demo (-8% week-to-week change) with 2.63 million; tied for fourth place in the timeslot with Charlie’s Angels. Season average: 1.3 in the demo with 2.75 million. In week three, the ratings came up just a little with a 1.3 in the demo and 2.74 million. The show continues to be the network’s most successful program. Season average: 1.3 demo with 2.79 million. Week two was not as kind to Vampire Diaries. It dropped a disturbing 20% in the demo to a 1.2 rating and 2.52 million viewers. That matches the show’s worst performance of last season. It’s still CW’s strongest series but this isn’t a positive turn. Season average: 1.4 demo with 2.81 million. The drama returned with a 1.5 rating in the 18-49 demographic and 3.1 million viewers. That was a year-to-year decline of about 6% and in the demo and could considered positive since the series wasn’t faring as well at the end of last season. It was in fifth place in its timeslot, as the CW shows usually are. Reference point: The 2010-11 season averaged a 1.4 rating in the 18-49 demographic and 3.16 million viewers. What do you think? Do you like the Vampire Diaries TV series? Do you think it should be cancelled or renewed for a fourth season? I realy love this show.please i want it †☺ be renewed,over and over again.its my best TV show. I love this show, its my favourite, I love watching it, I have never missed an episode! Please let it be renewed for a fourth season! The Vampire Diaries have only been on for 3 seasons, and 2 of the seasons have been about the orginials, 2 entire season about the orginials , really. I have only watch about half of the shows for season 3, if the story line does not change early in season 4, like episode 2 I will stop watching. I am really sick of the orginials. Julie Peck needs to broaden her scope and develop the supporting characters more. Develop a different story line, surely she has more of an imagintion. The show is very boring. I luv this show….they’ll keep the three of them going back and forth, it keeps the ratings up, like “Rose said, She’s hoping for Elena and Damon, but Stephan is Elena’s perfect love.” and it keeps the fans of the “bad boys” watching and the fans who’ve grown out of that phase watching too. I hope Elaric changes back, and the whole cast stays, bcuz yhey are all wonderful. If the Vampire Diaries cancel, I will have nothing to live for! I think they should keep it! But stop making Elena a *****… I liked her better in the last season. I’m totally addicted to this show, would be devastated if it was cancelled although I do admit that I find the pace of the “love triangle” tediously slow. Vampire diaries better not cancell! I freakin love this show. I love how damon & elenas relationship is growing, BUT id lyk 2 see stephan go back to the normal him so him and elana can b back together. Im getting sick of his “I dont care about anything or anyone attitude” though. But I will NOT b pleased if its cancelled! Im sick of all the good shows being the 1s that get cancelled all the tym. LOVE The show! I think it should go into a 4th season! I don’t think it should be canceled. I love watching it every week there are new episodes! It has become 1 of my favorite shows! I never miss an episode. every other show and its cast is THE BEST! !im greek….imagine..how many people around Europe have been watching this show for three years now and they have completely adored it!…. I am still enjoying the show. I kind of wish that not all the antagonists had a heart that kept them from doing some serious destruction to the protagonists.